Weezer has proven over the years that, while they are capable of making good (occasionally great) records, they are not capable of consistently putting out a string of good albums. Perhaps more than any other band in today’s alternative rock landscape, their albums tend to be hit-or-miss. 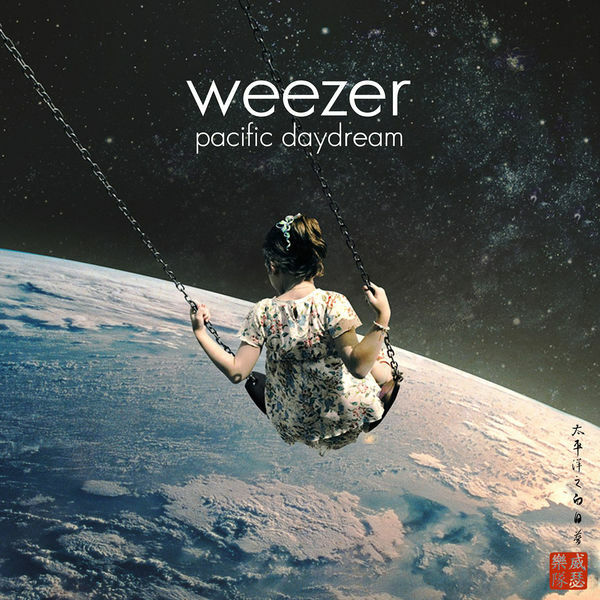 With Pacific Daydream, Weezer has released one of the most uninspired albums in their discography. Right from the get-go, Rivers Cuomo and company come out sounding like they’ve been listening to nothing but Top 40 music during the last eighteen months since they released their last record. This album is deeply overproduced, taking away the human element that has made Weezer so successful in the past. It features several awkward moments that, until now, have not been present in the band’s music. This LP reeks of nearly 50-year-old rock stars desperately trying to appeal to a teenage base, and it comes off as out of touch. Over the course of Weezer’s career, Cuomo hasn’t exactly been a wordsmith, but his lyrics have never been so brutally bad that it damages the listenability of the music. Pacific Daydream changes that. I caught myself wincing at some of the lyrics on more than one occasion. Many of the lyrics are not coherent with the rest of the song, and they often struggle to find a central theme. Weezer finds themselves relying too much on pop choruses to make the music intriguing on this album. The tracks “Beach Boys” and “Any Friend of Diane” are perhaps the two biggest examples of this, as around half of the lyrics on those songs feature Cuomo singing a one-line hook over and over again. Another unusual element of the record is that three tracks in the middle of the album randomly feature bells. They don’t show up until the 5th track, then they stay through the 7th. At times in “Weekend Woman” and “Sweet Mary” the sound is like Christmas bells, and it seems to come totally out of left field. The band’s lead single for this album, “Feels Like Summer” is perhaps the most generic and boring track on the entire album, making it a tad surprising that it would be featured so heavily in comparison to other tracks on the album. The only song I genuinely like on this record is “QB Blitz”. The pop hook is there in the chorus (but it’s not over done), and the lyrics don’t kill the song. If Weezer released an entire album of songs like this, I would be singing a different tune in this review. Sure, the album might be good as the background music at a party, but that’s not even necessarily a compliment. This album is, at best, mediocre party music, and at worst, an embarrassing attempt to enter the realm of mainstream pop music. I have always respected Weezer for being willing to release music that isn’t their norm. Unfortunately, Pacific Daydream falls very short of what you’d expect from a band of this caliber. Favorite Tracks: QB Blitz, Mexican Fender, Beach Boys.